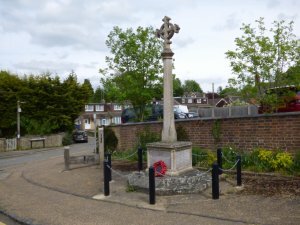 Silverstone's War Memorial is located on Stocks Hill opposite St. Michael's Church and lists those who died in the two World Wars. Within St. Michael's Church is a complete list of all those who served in the forces during the First World War. A village Remembrance Service takes place on Remembrance Sunday gathering at 10.40 at the Methodist Church, processing to the War Memorial for the Act of Remembrance and the two minutes' silence at 11.00 with a concluding service afterwards in St. Michael's Church.